7 Law Enforcement Officers Shot, 1 Killed In South Carolina The incident began around 4 p.m. just outside the city of Florence as deputies tried to serve a search warrant. Authorities identified a suspect and say he is in custody. 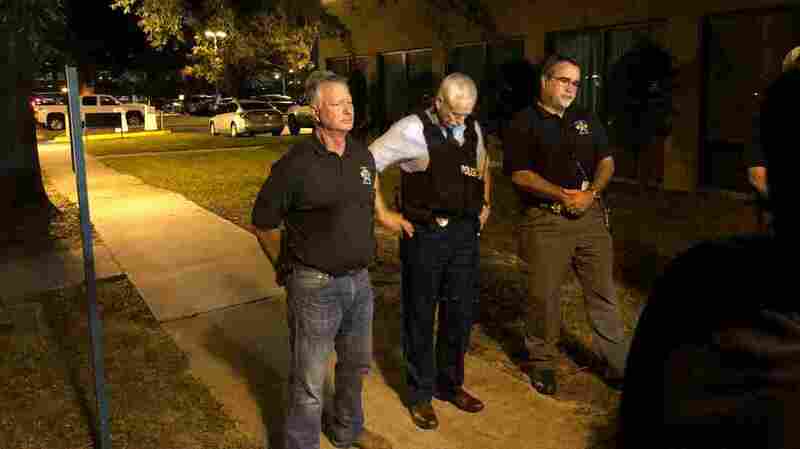 (From left) Florence County, S.C., Sheriff Kenney Boone, Florence Police Chief Allen Heidler and Florence County Chief Deputy Glenn Kirby speak to reporters about the shootings of law enforcement officers on Wednesday. Seven law enforcement officers were shot — one fatally — in Florence, S. C., Wednesday evening, city police and sheriff's officials said. A city spokesman identified him as Officer Terrence Carraway. Deputies on Thursday identified the alleged shooter as 74-year-old Frederick Hopkins, a military veteran who received disability payment. He was also a lawyer who had been disbarred. The shooting occurred just outside Florence, a city two hours north of Charleston. At an emotional press conference, authorities said they didn't have all the details. Major Michael Nunn with the sheriff's office said around 4 p.m., Florence county sheriff's deputies attempted to serve a search warrant at a residence someone inside opened fire on the officers. Authorities later said the search warrant involved an allegation that someone in the residence had sexually assaulted a foster child in the home, The Associated Press reported. After the sheriffs were shot, the police department got involved. "The suspect continued to fire on other officers who responded to the scene to render aid to the wounded," Nunn said. "Fire was being shot all over," Florence County Sheriff Kenney Boone said. "The way the suspect was positioned, his view of fire was several hundred yards so he had an advantage and the officers couldn't get to the ones that were down." The standoff lasted approximately two hours. The subject was barricaded in the residence with children, authorities told reporters. Police Chief Allen Heidler said that the children were now in a safe place. He added that the even would "mark a very horrific day in the annals of the Florence police department." Four police officers and three sheriff deputies were shot, Heidler said. He said the officer who died had been his friend for 30 years and was "the bravest police officer that I have ever known." Chief Deputy Glenn Kirby of the Florence County Sheriff's Office also said that a 20-year-old man in the home was wounded, according to WBTW. Eventually, the wounded officers were evacuated with the help of a bullet-resistant rescue vehicle and taken to nearby hospitals. The sheriff's office and police department's tactical team got the suspect out. Hopkins surrendered after speaking with a negotiator, according to WBTW. He was taken to a hospital for treatment for a head injury and is unable to speak with officers, WIS-TV reported. "The active shooting situation is over and the suspect is in custody," the Florence County Emergency Management department said Wednesday evening on Twitter. Two of the three injured deputies were said to be in critical condition and the third, who was shot in the leg, was in stable condition, he said. Of the three surviving police officers, one suffered a graze wound to his head and was paralyzed on one side, Kirby said. Another officer was in stable condition, and a third, shot in the thumb, was released from the hospital, Kirby said. The Charleston County Sheriff's office said it would be sending deputies to Florence to support the community and law enforcement operations. Hopkins had received charges prior to the incident, the AP reported. On social media, photos and comments showed him to be a marksman who took his children to shooting ranges. "I just love the smell of gunpowder in the mornin's," he reportedly wrote for his 70th birthday. Sen. Tim Scott, R-S.C., took to Twitter to write, "Prayers with injured officers in Florence and their families." "This is simply devastating news from Florence," Gov. Henry McMaster said. He encouraged people to pray for their recovery and ordered flags in South Carolina to be lowered to half-staff for the officers. President Trump also commented on Twitter, saying, "My thoughts and prayers are with the Florence County Sheriff's Office and the Florence Police Department tonight, in South Carolina. We are forever grateful for what our Law Enforcement Officers do 24/7/365." Terrence Carraway, the officer who died Wednesday, had just received his 30-year service pin from the department, according to local media.